Bertram Bildverarbeitung is a high achieving third generation family company with a good reputation both in Germany and worldwide. Having worked in the field of glass for over 20 years, we understand the needs of the glass manufacturers which enables us to offer innovative, practice-orientated solutions. We specialise in custom image processing solutions in the cold end of the glass manufacturing process. Together with Bertram Elektrotechnik we can provide complete automatisation solutions. We understand the need for the precise orientation of containers at some points in the process: for quality control; labelling; packing; etc. We have, therefore, designed an Orientator which can turn the containers to the desired orientation for the next part of the process. As well as this we offer a Separator, which recognises the containers and can tell an Allocator to which conveyor belt tracks they should be sent. The Allocator then pushes them to the desired track. 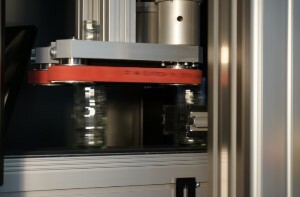 The Separator allows bottles and/or jars to be distributed between up to four tracks without changing the production speed. With its fast industrial image processing in combination with the corresponding SPS-programming, Bertram’s system works so flexibly that it can handle all standard tasks. Resulting, in essence, from the shape and number of bottles and/ or jars, and their allocation to the correct tracks. 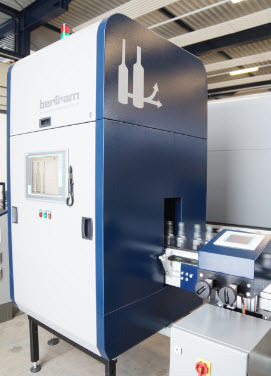 Bertram’s bottle separator consists of a powerful industrial image processor, that is controlled by a pre-programmed, ready to use IPC-control system and a servomotor driven Allocator. Individual adjustments to the respective applications can be made directly on the module, either through an integrated touch screen, a USB connection with an external keyboard, or, the most convenient, remotely from your PC. We use forward-looking technology based on real-time ethernet, in the form of Profinet-communication at the input/ output level.